Some great books by Terrence Deacon and his colleagues. I found this book to be more enlightening than any book I've ever read with the exception of Darwin's Origin of Species. In this broad and deep book, Terrence Deacon presents a very plausible scientific explanation of how life and mind may have emerged from matter. It's a heavy read (about 550 pages) but there are no equations. Deacon synthesizes the ideas from many disciplines and advances the field with original creative insight, such as his conception of the autogen. Life and mind are hierarchical complex dissipative far-from-equilibrium dynamic systems (see Ilya Prigogine). Rather than starting with speculations about consciousness, Deacon builds on a solid foundation by starting at the bottom (atoms) and working upward (life and then mind). Lower level dynamic systems interact and constrain each other, thus creating higher-level dynamic systems with entirely new emergent properties. Constraints drive nature’s creativity. Deacon emphasizes three levels of emergent dynamic systems: Thermodynamics → Morphodynamics (form-creating systems) → Teleodynamics (end-directed, self-creating systems). The description is more physical than philosophical. Entropy may decrease locally but must increase globally. Physical work must be done at the lower levels to create emergent properties at the higher levels. Deacon generalizes the concept of work to include higher levels of work, such as mental work, always rooted in low level physical work. The core of the book is Deacon's very plausible description of how the first proto-life may have formed from non-life. In some primordial soup, two or more types of molecules happen to catalyze the production of each other in a cycle (autocatalysis). Furthermore, one of the molecules in this cycle also happens to self-assemble into a simple tube or capsule (containment). The capsule happens to capture some catalysts. When the capsule happens to break open the cycle begins again and it replicates, if the necessary substrate molecules are around. It's called an autogen (or autocell). 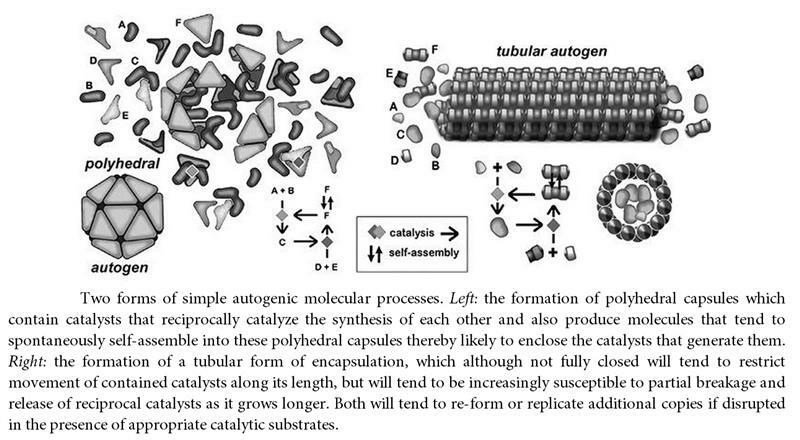 Diagram of a hypothetical autogen (both polyhedral and tubular forms) from Incomplete Nature. To see how it works, an animation is even better than a diagram. Good autogen animations are here: Autogen Demo, Neither Ghost Nor Machine, What Is Trying by Jeremy Sherman. The autogen would be the first self-creating, self-maintaining system, the first teleodynamic system, the beginning of life. It only requires a few types of molecules and none very complicated (no RNA or DNA). Deacon carefully points out that autocatalysis by itself is self-undermining and containment by itself is self-undermining, but the combination of autocatalysis and containment would be self-sustaining. Furthermore, he points out that a simple impermeable but breakable capsule suffices; it does not require a more complicated semi-permeable membrane as in the autopoiesis model (see Luigi Luisi, Evan Thompson, Francisco Varela). This careful, realistic reasoning is what makes the argument so credible. With this first self-replicating autogen, the evolution ratchet begins. Eventually, evolution will produce efficient living cells, with features like semi-permeable cell membranes, energy molecules (ATP), and simple information molecules carrying signals about the environment. Later, complex information molecules (RNA or DNA) would evolve. The appearance of the first teleodynamic systems introduce many abstract attributes into the physical world. Autogens are the first (nonsentient) selves, so we can now say their parts have function, purpose, or value, with respect to these selves. With these first selves, and especially when autogens evolve to start using the first simple information signal molecules, we can now say the physical world contains contentful information, representation, and meaning, as interpreted by these selves. The roots of mental attributes are found in these first selves even before the evolution of neurons and brains. Higher levels of teleodynamic systems create higher levels of emergent mental attributes: vegetative sentience, neuronal sentience, intention, emotions, feelings, and eventually human consciousness. Deacon does not concentrate on these higher levels as he did in setting the foundations for the lower levels, but he does not need to. Once you see that so many features of both life and mind have their roots in something as simple as the autogen, the deep mystery of the origin of life and mind is dispelled, and you can see how the higher mental attributes will inevitably evolve by adding more layers by the same mechanisms of emergence by constraint. I think Deacon does not claim to completely solve the "hard problem" of consciousness (qualia), but he significantly advances our understanding of sentience and consciousness, and he is able to answer to some deep questions, such as the following. Animal brains are sentient because they are dynamically deep self-creating systems (they have a real self), whereas even complex intelligent computers are not sentient because they are dynamically shallow and not self-creating (they have at most a simulated self). Mind is not based on quantum weirdness — mind emerges at dynamic levels higher than the quantum level. The chapters are: 0. Absence, 1. (W)holes, 2. Homunculi, 3. Golems, 4. Teleonomy, 5. Emergence, 6. Constraint, 7. Homeodynamics, 8. Morphodynamics, 9. Teleodynamics, 10. Autogenesis, 11. Work, 12. Information, 13. Significance, 14. Evolution, 15. Self, 16. Sentience, 17. Consciousness. You may have a slow start when you read this long book because the first chapters are very abstract and the next chapters are spent clearing away deadwood but then it gets more compelling as it builds up, step by step, to the autogen and beyond. The book is so broad and so deep, it is almost impossible to summarize. For an outline, see Incomplete Nature in Wikipedia. For a shorter version of the book, read Neither Ghost Nor Machine by Jeremy Sherman (see below). But to get the full depth, read the whole book Incomplete Nature. You can find a lot online by searching for teleodynamics or teleodynamics videos. There are videos of Deacon on Jeremy Sherman's Neither Ghost Nor Machine YouTube channel. Check out Deacon's lecture about Incomplete Nature in 2012. You can also see Deacon in the videos of Sean Carroll's fascinating Moving Naturalism Forward Workshop 2012. If you want more about the brains and minds of higher animals and humans, symbolic thinking, language, and information, read Deacon's book Symbolic Species. Note: I'd like to give due credit to Alicia Juarrero for her earlier (1999) groundbreaking ideas about the origin of intention in Dynamics in Action: Intentional Behavior as a Complex System. I think Dynamics in Action partially succeeded in demystifying the origin of intention, but was missing critical pieces to the puzzle. In particular, Dynamics in Action presents a model of life based on autocatalysis but it misses the critical fact that autocatalysis without containment is a self-undermining process. Without a plausible solution to the difficult problem of how autocatalysis first becomes self-sustainable through partial containment, the origin of intention is not fully solved. Jeremy Sherman is a colleague of Terrence Deacon. Sherman's Neither Ghost Nor Machine is primarily a briefer, but not too brief (it's about 265 pages), presentation of main ideas in Deacon's Incomplete Nature, namely, the nature and origin of selves and aims. I think it succeeds: it is shorter and easier to read than Incomplete Nature but it fully communicates most of the important ideas, except for the last chapters of Deacon's book. If you're not going to read Incomplete Nature, then you'll do very well to read Neither Ghost Nor Machine instead. Sherman's writing is easy to read. He uses more familiar terms than does Deacon, for example "aims" rather than "ententional phenomena", "the second law [of thermodynamics]" rather than "homeodynamics", "emergent regularization" rather than "morphodynamics", and "emergent self-regeneration" rather than "teleodynamics". The organization of the book loosely follows Incomplete Nature. Sherman starts with a helpful overview telling you where we're headed. Next, he clearly frames the question. He points out some traps to avoid, such as supernaturalism, eliminativism, or equivocation. Then he builds to the solution by explaining emergence through constraints, and the hierarchical levels of dynamic systems: second law → emergent regularization → emergent self-regeneration. Emergent self-regeneration has capacities for self-repair, self-protection, and self-regeneration. Before presenting Deacon's autogen solution to the origin of life, Sherman first explains why some of the competing models, such as the RNA World model with uncontained RNA and the autopoiesis model with a semi-permeable membrane (see Luigi Luisi, Evan Thompson, Francisco Varela), don't quite solve the problem. Sherman's description of Deacon's autogen is in some ways more complete than that given in Incomplete Nature. He elaborates on three types of autogen conceived by Deacon: the minimal autogen, the selective autogen with an ability to sense its environment, and the template autogen with internal information molecules simpler than RNA or DNA. The book has helpful diagrams for all these types of autogen. Then, as Sherman puts it, "emergent with the autogen are the essential abstract features of life all rolled into one, and there are many such features", such as good-bad, self-other, foresight, and memory. There's a section about how information is interpreted by selves. He describes three types of signs: icon, index, and symbol. In the interest of keeping the book short, Sherman then skips forward to discussions of the implications of the theory relating to evolution in general and the human condition. What's missing from this book is a step-by-step progression up the hierarchy of levels of life after the autogen and before the human, namely unicellular organisms, plants, and animals. He barely mentions neurons and brains, mostly skipping Incomplete Nature's chapters on sentience and consciousness. This omission is defensible because the roots of mental attributes are already present in the first self, so the mystery of origins of mind has already been addressed. Sherman barely mentions Deacon's generalized concept of work, an entire chapter in Incomplete Nature. Sherman sometimes ventures into talking about quantum theory, but you may ignore these tangents. As he says, "the key appears to be available within classical physics and chemistry ... not the quantum scale." As to free will, Sherman says "free or not, will emerges as a self and its aims" — in other words, we can only discuss will with respect to selves, not with respect to the universe. I take this to mean that one's will may be free with respect to one's own life, regardless of whether the physical universe is deterministic or not. The sections are: I. Overview, II. Framing the Mystery, III. Dead Ends, Live Clues, IV. Grounding a Solution, V. Deacon's Solution, VI. The Interpreting Self, VII. Implications. For videos, go to Sherman's Neither Ghost Nor Machine YouTube channel. Check out these specific videos: Neither Ghost Nor Machine, What Is Trying, Autogen Demo.